Music fans are in for a treat this Friday as Columbus native Danyel Morgan takes the stage at the Troubadour Club in Columbus. With his amazing music skills, Danyel has secured four major endorsements with companies such as Lakland, Yamaha, Mesa Boggie and GHS Strings. He has two signature Bass Guitars and has been named one of the top 25 Bass players by Bass Magazine. Danyel has proven to be the show stopper and takes the audience to another level. He currently performs with his own Band Danyel Morgan and the Monstars as well as Robert Randolph & the Family Band. As a child, Danyel was influenced by his father and began playing the bass with family members and gospel groups at the age of five. The first song he ever played was “Love & Happiness” by Al Green. Danyel also remembers his youthful days listening to his idol Stanley Clarke. Around 2000, Danyel left Ohio to play and sing along with Warner recording artist Robert Randolph and the Family Band. The band has released two successful albums, which Danyel has either written or co-written and performed vocals on most of the songs including the 2003 Grammy Award-winning song entitled “Blind Boy of Alabama” and the two-time 2004 Grammy nominated song “Squeeze,” which is the source music for a video game. The Family Band’s Unclassified album won a 2004 Dove Award, and they performed at the 2004 Grammy Awards. 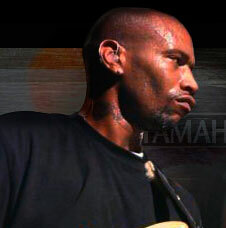 Danyel along with the band has toured the United States and Europe with Dave Matthews, Carlos Santana, Eric Clapton, The Neptunes, The Roots, John Mayer and many others. He has been featured on VH1, Conan O’Brien, The Tonight Show, Austin City Limits, The Grammys, MTV and many others. Danyel has proven to be the show stopper and takes the audience to another level. He was even recruited by Eric Clapton and Carlos Santana to perform as a part of their stage show. Now with so much experience under his belt, Danyel is working on his solo project that he wants and hopes the world will enjoy. Danyel Morgan- LIVE @ the BASEMENT! from GingerATTACK! Video Production on Vimeo. Roger Baccus was born the fifth child of ten to Oscar Baccus and Carrie Belle Griggs-Baccus. Five of their children were blind from childhood. He was introduced to music early in life. Roger has a background playing the upright bass and then the Hammond organ and later begun using the electronic keyboard. He states, “That big Hammond C-3 just got too heavy to move!” He has always liked to sing and wrote poetry, thus, song writing was a natural for him. He was introduced to music early in life His older brother, Eddie became a professional pianist/organist. A younger brother, Ken, started playing guitar and switched to organ. His sister, Vernell Taylor, is an accomplished classical pianist and vocalist. His sister, Carolyn Martin, played drums and alto Horn in high school. He joined a traveling band straight out of high school and traveled for a year. He then moved to Dayton and then Columbus, Ohio, continuing to play in clubs and restaurants.